The Phoenix OverLord Military Series RSM is a next generation Speaker Microphone for the most demanding global DOD and Tactical applications. The feature rich Phoenix is waterproof to IP68 and is built to meet full MIL-STD 810G environmental requirements. Designed, Engineered, Assembled, Tested and Supported with Pride in the USA. The Military Series Phoenix is a next generation Speaker Microphone for the most demanding global DOD and Tactical applications. The feature rich Phoenix is waterproof to IP68 and is built to meet full MIL-STD 810G environmental requirements. Waterproof – Built to IP68 standards, 1 meter for 31 minutes. Designed to meet full Mil 810 C, D, E, F & G specifications for use in the harshest environments. Ideally suited for the most demanding DOD, Military, SWAT, etc. applications. 50mm Neodymium magnet, Mylar waterproof speaker for unsurpassed audio clarity and Sound Pressure Level (SPL). 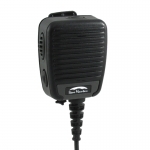 Ultra sensitive, high gain omni directional microphone for crystal clear transmit audio. Instant Hi/Lo volume control with 9 dB delta. Features SureSealTM patent pending waterproof 2.5mm remote Rx audio jack. 5mm Rx audio jack available also. Features WhisperTekTM sub audible Tx audio system for enhanced Voice Intelligibility. Features OutLoudTM high Rx audio output speaker system for enhanced Voice Intelligibility. Features AllClearTM Dual Microphone Active Noise Cancelling System (on certain models). Optional SureTactTM patent pending 6 pin Hirose accessory interface supports remote Rx, Tx and PTT. 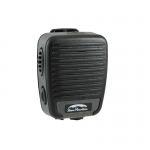 Includes one touch system to switch between speaker mic and remote accessory Rx and/or Tx audio. Optional MagShieldTM custom engineered acoustic shroud designed to significantly reduce/eliminate ingress of metalized dust/filings, sand, dust, etc. into the speaker cavity without degrading or decreasing speaker output level. Interfaces with the full line of Stone Mountain Omaha Rx, Tx & PTT accessories. Highest quality fully interchangeable polyurethane cables, machined high strength brass ferrules and aircraft grade fluorosilicon o-rings. Plastic & rubber two shot molded ergonomic design for ultimate comfort during prolonged use with integrated high tactile response PTT. Fully connectorized, field repairable / replaceable parts – Requires only a Torx T6 driver. No soldering. For example, a cable assembly can be replaced in under 60 seconds – Repaired unit maintains full waterproof integrity. Military grade 100% gold plated PCB’s for unsurpassed performance and reliability. Accessory Interface SureSealTM 3.5 mm & 2.5 mm for remote Rx audio or SureTactTM 6 pin Hirose for remote Tx, Rx and PTT functions & ProGramTM system.